Previous studies have established a correlation between increasing chronological age and risk of cirrhosis. This pattern raised interest in the role of telomeres and the telomerase complex in the pathogenesis of liver fibrosis and cirrhosis. This review aims to summarize and analyze the current understanding of telomere regulation in hepatocytes and lymphocytes and how this ultimately relates to the development of liver fibrosis. 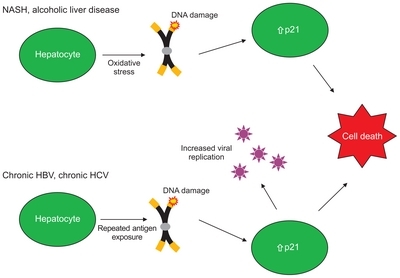 Notably, in chronic viral hepatitis, telomere shortening in hepatocytes and lymphocytes occurs in such a way that may promote further viral replication while also leading to liver damage. However, while telomere shortening occurs in both hepatocytes and lymphocytes and ultimately results in cellular death, the mechanisms of telomere loss appear to be initiated by independent processes. The understanding of telomere maintenance on a hepatic and immune system level in both viral and non-viral etiologies of cirrhosis may open doors to novel therapeutic strategies. Liver cirrhosis is a significant source of morbidity, mortality and health care spending with recent estimates reporting a prevalence of 0.27% in the United States.1 There are a variety of disease states and processes which can lead to end stage liver disease including viral infections and alcohol consumption. However, there are common factors which correlate with disease progression and clinical outcome pointing toward potential common mechanisms and corresponding treatment targets. A number of studies have established a correlation between increasing age and risk of cirrhosis.2,3 This pattern has raised interest in the role of telomeres and telomerase in the pathogenesis of liver fibrosis and cirrhosis. A number of studies and case reports have been published to date characterizing or quantifying the relation between both hepatic or immune cell telomeres and liver fibrosis. This review aims to summarize and analyze the current understanding of telomere regulation at the hepatic and immune system level and how this relates to the progression of liver fibrosis. We searched the databases MEDLINE and PubMed for studies regarding telomeres and cirrhosis from 1995 to the present day. We used a combination of the key words “telomere,” “telomerase,” “Hepatitis B virus,” “Hepatitis C virus,” “chronic viral hepatitis,” and “cirrhosis.” Bibliographies of all identified studies were searched for relevant articles for additional studies. We included all studies published in scientific journals discussing the relationship between cirrhosis in humans and telomere length and function. The theory of telomere dysfunction as causative in liver fibrosis and, ultimately, cirrhosis was initially posited on the basis of hereditary syndromes involving mutations in the telomerase complex. For example, short telomere syndrome presents as idiopathic pulmonary fibrosis (IPF) and cryptogenic cirrhosis. This is driven by a defect within the telomerase complex secondary to a mutation in TERT or TERC.10 Other familial syndromes of synchronous IPF and cryptogenic cirrhosis have been described. In one family a heterozygous TERT mutation (L153M) and a heterozygous hTERT polymorphism (A305A) were implicated.11–13 These inherited syndromes pointed to a role for telomere shortening in the progression of liver fibrosis and subsequent organ failure. These findings raised the question whether telomere maintenance and telomerase function play any role in the pathogenesis of other etiologies of liver fibrosis. While the mechanism of cell cycle arrest to promote viral replication and subsequent hepatocyte senescence has been accepted in regard to viral hepatitis, current data would suggest that while the ultimate pathway is common in NASH, the inciting mechanisms for telomere damage may differ. Previously studies have proposed that cell cycle arrest and senescence in NASH and alcoholic liver disease are the direct result of oxidative stress on hepatocytes (Fig. 1).18 This stress in turn leads to telomere attrition and cellular senescence.21 Ultimately, p21 and other markers of senescence are elevated in both hepatocytes populations and this cascade ultimately leads to fibrosis (Fig. 1). Data regarding immune telomere maintenance in NASH and alcoholic liver disease are unfortunately not as a robust as in viral hepatitis. Despite this there exists data and observations which imply a potential role for immune senescence in the pathogenesis of NASH. For instance, accelerated immune senescence has been demonstrated in type 2 diabetes mellitus which is strongly associated with the development of NAFLD.29 In addition, as discussed above, TERT knockouts experienced accelerated hepatic steatosis likely in keeping with impaired hepatocyte telomerase. However, given that the murine models in question were global knockouts, a role of enhanced immune senescence may have played a role in the steatosis observed.21,30 Further studies will be needed to clarify the extent to which impaired immune telomere maintenance fuels the development of NAFLD. As outlined above, the dynamics of telomere maintenance and telomerase function within immune cells in the setting of chronic viral infections offer many potential points of intervention. There is the question of whether an exhausted T cell population could be reactivated against the chronic viral infection in question. This concept has led to research into the possible utility of PD-1 inhibitors in viral hepatitis with the goal of reactivating exhausted T cells when this inhibitory pathway within the immune system is blocked. It appears that in HBV this may be the case. In an in vivo model blocking PD-1/PD-L1 interactions, there was increased effector immune cell response and viral clearance.33 Further studies are necessary to see whether the results of these studies can be replicated on a clinically meaningful level. From another angle there is also ongoing work to develop therapeutic vaccines targeted at stimulating the CD8+ T cell response in patients with chronic HBV.22 Both strategies offer exciting possibilities for the millions of patients impacted by this disease. Notably absent from the current body of literature regarding T cell telomeres and the development of cirrhosis is discussion of the non-viral etiologies of end stage liver disease, such as NASH and alcoholic cirrhosis. Our current model proposes that in viral hepatitis repeated antigenic stimulation of immune cells leads to the transcriptional silencing of the telomerase promoter which ultimately results in telomere shortening and senescence.22 It may be the case that repetitive oxidative stress in NASH triggers senescence by a similar pathway in immune cells leading to a common targeted therapy. Further studies are necessary to model and clarify these theoretical pathways. Telomere preservation and telomerase function in both hepatic and immune cell populations play key roles in the development of liver fibrosis and ultimate cirrhosis. However, the mechanisms which initiate telomere loss appear to be independent. There remains work to be done to further elucidate the mechanism or mechanisms of hepatic telomere and immune telomere shortening in non-viral etiologies such as NASH and alcoholic cirrhosis. Further clarification of mechanisms of telomere shortening and telomerase impairment is necessary if we are to be successful in clinically targeting this pathway. Role in the study: study concept and design (A.B., S.S.); acquisition of data (A.B., A.M.); analysis and interpretation of data (A.B., A.M., S.S.); drafting of the manuscript (A.B., A.M., S.S.); critical revision of the manuscript for important intellectual content (A.B., S.S.); statistical analysis (not applicable); administrative or technical, support; study supervision (A.B., A.M., S.S.). Fig. 1. Pathways of telomere hepatocyte damage. Telomere shortening in hepatocytes is observed in multiple etiologies of cirrhosis. A stressor, either repeated antigen stimulation or oxidative stress, leads to the dysfunction of telomerase and the shortening of telomeres. These shortened telomeres are then recognized as damaged DNA. Increased markers of DNA damage, such as p21, are observed and result in increased cell cycle arrest. In viral hepatitis this cell cycle arrest leads to increased viral replication. NASH, nonalcoholic steatohepatitis; HBV, hepatitis B viral infection; HCV, hepatitis C viral infection. Fig. 2. T cell exhaustion. Upon initial antigen encounter T cells can reactivate telomerase allowing for rapid proliferation in response to acute infection. However, if the infection and antigenic stimulus persist telomerase expression will cease. This leads to a reduction in telomere length followed by activation of a DNA damage signal, which triggers apoptosis. Scaglione, S, Kliethermes, S, and Cao, G (2015). The epidemiology of cirrhosis in the United States: a population-based study. J Clin Gastroenterol. 49, 690-696. Yim, HJ, and Lok, AS (2006). Natural history of chronic hepatitis B virus infection: what we knew in 1981 and what we know in 2005. Hepatology. 43, S173-S181. Poynard, T, Ratziu, V, Charlotte, F, Goodman, Z, McHutchison, J, and Albrecht, J (2001). Rates and risk factors of liver fibrosis progression in patients with chronic hepatitis C. J Hepatol. 34, 730-739. Blackburn, EH (2001). Switching and signaling at the telomere. Cell. 106, 661-673. Evans, SK, Bertuch, AA, and Lundblad, V (1999). Telomeres and telomerase: at the end, it all comes together. Trends Cell Biol. 9, 329-331. Shammas, MA (2011). Telomeres, lifestyle, cancer, and aging. Curr Opin Clin Nutr Metab Care. 14, 28-34. Verma, S, Tachtatzis, P, and Penrhyn-Lowe, S (2012). Sustained telomere length in hepatocytes and cholangiocytes with increasing age in normal liver. Hepatology. 56, 1510-1520.
von Zglinicki, T (2002). Oxidative stress shortens telomeres. Trends Biochem Sci. 27, 339-344. Sasaki, M, Ikeda, H, Haga, H, Manabe, T, and Nakanuma, Y (2005). Frequent cellular senescence in small bile ducts in primary biliary cirrhosis: a possible role in bile duct loss. J Pathol. 205, 451-459. Al-Issa, K, Tolle, LB, Purysko, AS, and Hanouneh, IA (2016). Short telomere syndrome and fibrosis. QJM. 109, 125-126. Carulli, L, Dei Cas, A, and Nascimbeni, F (2012). Synchronous cryptogenic liver cirrhosis and idiopathic pulmonary fibrosis: a clue to telomere involvement. Hepatology. 56, 2001-2003. Carulli, L (2015). Telomere shortening as genetic risk factor of liver cirrhosis. World J Gastroenterol. 21, 379-383. Carulli, L, and Anzivino, C (2014). Telomere and telomerase in chronic liver disease and hepatocarcinoma. World J Gastroenterol. 20, 6287-6292. Wiemann, SU, Satyanarayana, A, and Tsahuridu, M (2002). Hepatocyte telomere shortening and senescence are general markers of human liver cirrhosis. FASEB J. 16, 935-942. Marshall, A, Rushbrook, S, and Davies, SE (2005). Relation between hepatocyte G1 arrest, impaired hepatic regeneration, and fibrosis in chronic hepatitis C virus infection. Gastroenterology. 128, 33-42. Aravinthan, A, Pietrosi, G, and Hoare, M (2013). Hepatocyte expression of the senescence marker p21 is linked to fibrosis and an adverse liver-related outcome in alcohol-related liver disease. PLoS One. 8, e72904. Aravinthan, A, Scarpini, C, and Tachtatzis, P (2013). Hepatocyte senescence predicts progression in non-alcohol-related fatty liver disease. J Hepatol. 58, 549-556. Tachtatzis, PM, Marshall, A, and Arvinthan, A (2015). Chronic hepatitis B virus infection: the relation between hepatitis B antigen expression, telomere length, senescence, inflammation and fibrosis. PLoS One. 10, e0127511. Satra, M, Dalekos, GN, Kollia, P, Vamvakopoulos, N, and Tsezou, A (2005). Telomerase reverse transcriptase mRNA expression in peripheral lymphocytes of patients with chronic HBV and HCV infections. J Viral Hepat. 12, 488-493. Miura, N, Horikawa, I, and Nishimoto, A (1997). Progressive telomere shortening and telomerase reactivation during hepatocellular carcinogenesis. Cancer Genet Cytogenet. 93, 56-62. Nakajima, T, Moriguchi, M, and Katagishi, T (2006). Premature telomere shortening and impaired regenerative response in hepatocytes of individuals with NAFLD. Liver Int. 26, 23-31. Vodkin, I, and Loomba, R (2015). Editorial: NAFLD in HIV infection--call for action. Authors’ reply. Aliment Pharmacol Ther. 41, 591. Alves-Paiva, RM, Kajigaya, S, and Feng, X (2018). Telomerase enzyme deficiency promotes metabolic dysfunction in murine hepatocytes upon dietary stress. Liver Int. 38, 144-154. Bellon, M, and Nicot, C (2017). Telomere dynamics in immune senescence and exhaustion triggered by chronic viral infection. Viruses. 910, E289. Plunkett, FJ, Soares, MV, and Annels, N (2001). The flow cytometric analysis of telomere length in antigen-specific CD8+ T cells during acute Epstein-Barr virus infection. Blood. 97, 700-707. Bellon, M, and Nicot, C (2008). Regulation of telomerase and telomeres: human tumor viruses take control. J Natl Cancer Inst. 100, 98-108. Hoare, M, Gelson, WT, and Das, A (2010). CD4+ T-lymphocyte telomere length is related to fibrosis stage, clinical outcome and treatment response in chronic hepatitis C virus infection. J Hepatol. 53, 252-260. Hoare, M, Shankar, A, and Shah, M (2013). Gamma-H2AX+CD8+ T lymphocytes cannot respond to IFN-alpha, IL-2 or IL-6 in chronic hepatitis C virus infection. J Hepatol. 58, 868-874. Sampson, MJ, Winterbone, MS, Hughes, JC, Dozio, N, and Hughes, DA (2006). Monocyte telomere shortening and oxidative DNA damage in type 2 diabetes. Diabetes Care. 29, 283-289. Aravinthan, AD, and Alexander, GJ (2018). Telomere, telomerase and liver disease. Liver Int. 38, 33-34. Rey, S, Quintavalle, C, and Burmeister, K (2017). Liver damage and senescence increases in patients developing hepatocellular carcinoma. J Gastroenterol Hepatol. 32, 1480-1486. Kang, TW, Yevsa, T, and Woller, N (2011). Senescence surveillance of pre-malignant hepatocytes limits liver cancer development. Nature. 479, 547-551. Tzeng, HT, Tsai, HF, and Liao, HJ (2012). PD-1 blockage reverses immune dysfunction and hepatitis B viral persistence in a mouse animal model. PLoS One. 7, e39179.